Today's bento was a very quick one. I made my own mameshiba ... kind of different from the original one except for the face. The original mameshiba will have different ears from the one I made. If you are not familiar with mameshiba then you can take a look the video from 'Mameshiba World'. They all so cute and my kids loved to watch it when I showed it to them. I got the video link from Love For Dinner when I posted about Akinoichigo's bento books. 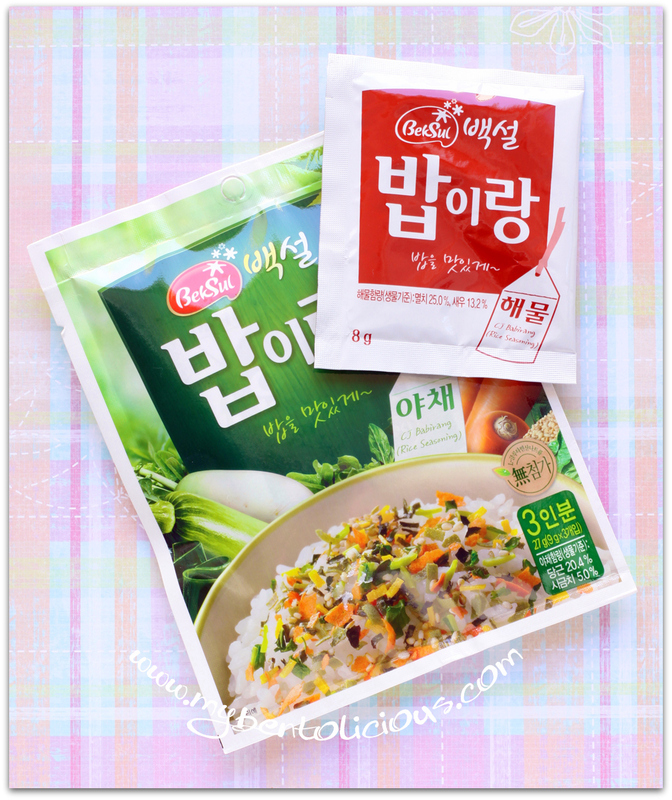 Babirang is rice seasoning from Korea. It's similar to furikake. I put the picture of the pack just in case if you are wondering what is it look like. Babirang comes in many variety of flavors. Each big pack will have 3 small individual packs for easy use and storage. Inside the first round box : yellow pan fried chicken with babirang on the top of steam rice. Inside the second round box : steam carrot seasoned with chicken powder, Chinese spinach with corns, and shrimp wonton. Put this bento to 'What's For Lunch' every Wednesday from Shannon's blog. Haa..I bought this Babirang days earlier too...:-D. Love the box in general and those cutey mice! @Indonesia Eats : Sure Pep since you are numero uno to comment hehehe ... Thanks a lot Pep! This looks so healthy and lovely colours! The 2 cute 'bears', are they quail eggs? Cute different mameshiba!!! :D. Huaaaaaa.... I love love love love those white round boxes, let me know about them please.... Hehehe, lagi gila sama round boxes :D. Btw, aku sering liat Babirang itu di toko bahan Asia di kota Malang, pengen beli yang cheese jadinya liat punya mbak lia, entah deh, mbak lia selalu membuatku kepengen ini itu hihihihi. @prince n pricess mum : Thanks a lot! As usual, I'm stunned and delighted by the creativity and sweet spirit of your bento...lovely! 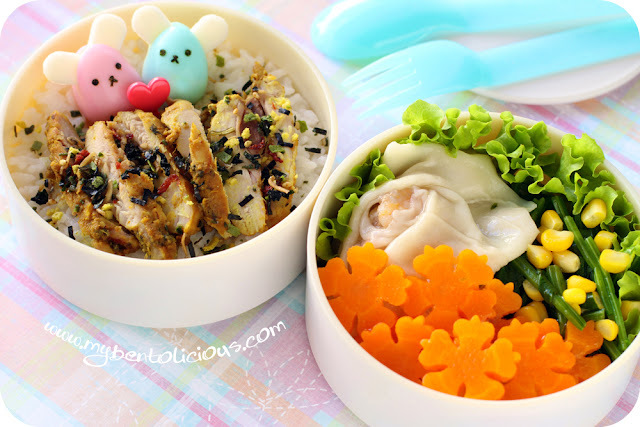 Lia, next time when you come to SG, please bring one of your cute bento to me. Your bentos are amazing! the little mameshibas are so cute!! @Lunch Buckets : Thanks a lot! they definitely have mameshiba faces... it's fun to change up certain features and make your own characters! the rice topping looks so delicious on top of the meat, and i love the prety corn kernels, they look like they are flowers growing on green vines/stems!